Dueling Pianos for Waves has become a must-attend event in Middle Tennessee, and Thursday, September 6 has been set for this year’s fourth annual soiree. 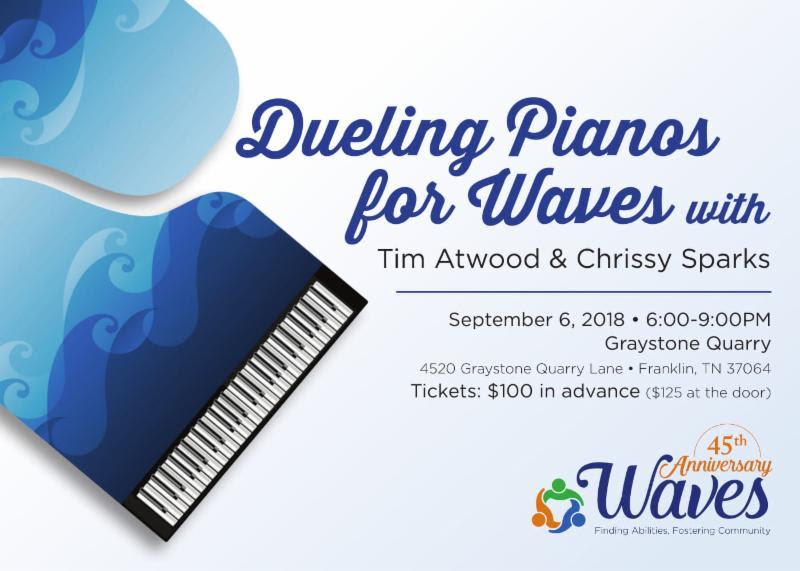 Award-winning pianists and vocalists Tim Atwood and Chrissy Sparks are set to duel it out at the beautiful Graystone Quarry in Franklin, and proceeds will benefit Waves, Inc. Doors will open at 6 p.m., and patrons will be treated to delicious food and discover one of the area’s newest and most sought-after event spaces. Live and silent auctions will feature many one-of-a-kind items, and specialty drinks from Grandaddy Mimm’s Authentic Moonshine will also be available. At 7:30 p.m., Tim and Chrissy will take their seats at pianos facing each other, and revelers will tip to have these accomplished artists sing their own and other piano-centric songs. Singing along is highly encouraged. Tickets for the exciting event are $100.00 in advance or $125.00 at the door and can be purchased at www.wavesinc.com. Admission includes food, drinks, and music, music, music! For questions, contact Emily Layton at elayton@wavesinc.com. About WAVES: Forty-five years ago, a group of citizens in Fairview decided to “make waves” for people with disabilities. Waves has provided a broad range of services for adults and children with developmental disabilities in Williamson County including home and community based early intervention services, day programs, residential programs, job training, and office recycling. About Tim Atwood: Tim Atwood has played behind some of the greatest country music performers of all time. For 38 years he played in the staff band at the world-famous Grand Ole Opry, performing alongside everyone from Garth Brooks to Carrie Underwood to Jeannie Seely. Over those years Atwood developed a reputation as one of the most polished and energetic performers to claim that stage. About Chrissy Sparks: Chrissy Sparks is an accomplished piano player, instructor and teacher from Champaign, Illinois. She helped form the Champaign Country Opry, where she and her Chrissy Sparks Band are regulars, and she hosts the popular Philo Country Opry in Philo, IL.